Greek Rizogalo is not a 'pudding' as such, but is a delightfully refreshing sweet that can be eaten at any time - for breakfast it is especially enjoyable! 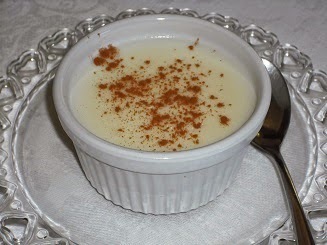 It is very easy and quick to prepare and can be served in small bowls (as in the photo) with cinnamon sprinkled on top, or larger bowls if you so wish. Put the milk, cream, rice and sugar into a pan and bring to the boil. Simmer for 30 minutes, stirring continuously with a wooden spoon. Pour into small bowls and set aside to cool. Once it has cooled, place the bowls in the fridge so that they can be served cold.